If you are already using legumes like black beans, navy beans, kidney beans, garbanzo/chickpeas, split peas, lentils, soy beans and/or peanuts in your diet, then this step is easy. You can simply increase the amount and how regularly you eat of this nutrient dense category in your diet. However, if you have not really cooked with these before, then this can be a whole new territory! You may be wondering, “What exactly are legumes?” (to learn more about legumes click here) and “How do I cook them?” Some of you may also be wondering if eating legumes will cause you to have more gas or affect your digestive system in other unpleasant ways. Well, I did! Don’t worry! 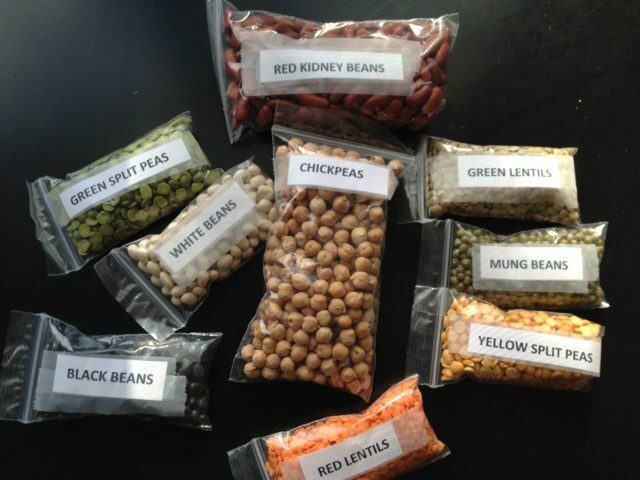 There are lots of ways to deal with these to help you successfully incorporate beans/legumes regularly into your diet. That’s another advantage of a slower gradual transition to a plant-based diet, as it will help your body gradually adjust to having a higher fiber and legumes diet. Today, let’s look more closely at a few different types of legumes. For those new to using beans and chickpeas (also known as garbanzo beans), the easiest way is to start with canned versions. Simply pop open a can, drain the liquid and then rinse the beans well before using. Some worry about the salt content in canned beans but it is really easy to remove much of the salt by properly rinsing and draining the beans. I usually open a can of beans into a colander, placing a plastic mixing bowl underneath. Then I fill up the colander with cold water, stir the beans a few times in the water, and then drain this liquid off by simply lifting the colander. I repeat this process a few times before using the beans in stir-fries, soups, making bean dips like hummus, slow cooker meals and other dishes. If you like, you can also let the beans sit in the cold water for a longer period before draining the liquid, to potentially help remove more salt content from the beans. Yes, it’s that easy! The benefits of using canned beans are that it is quick and easy, and also avoids the potential for toxic poisoning from phytohaemagglutinin. What is phytohaemagglutinin? Read on. In plants, animals and humans, there exist certain naturally occurring proteins called lectins which have important functions. However, phytohaemagglutinin is a type of lectin that is found in many species of beans and can reach high levels in some plants, particularly in red kidney beans, and have toxic effects. As little as 4-5 raw beans can trigger symptoms such as nausea and vomiting a few hours after ingestion. Slow cookers present a risk as the internal temperature of the food being cooked may not reach a high enough sufficient temperature to cook red kidney beans. Hence it may be best to use the canned versions of beans (especially red kidney beans) when making a slow cooker recipe. To use dry beans in slow cooker recipes, take steps to ensure beans are cooked well before using and also by the end of the cooking process. According to the United States Food and Drug Administration, it is recommended to soak dry beans in water for at least 5 hours, then boil the beans in fresh water for at least 30 minutes, before discarding this water and using the beans (for more information, see the Sources section below). If you are really worried, you can use canned red kidney beans instead of dry ones when you make a bean-based slow cooker recipe, or substitute the red kidneys beans in the recipe with a different type of beans. Want to learn more about how to cook and prepare dry beans to use in recipes? See Cooking Tips: How to Prepare & Use Dry Beans. There are many different types of lentils, coming in a range of sizes and colors such as yellow, red-orange, green, brown, and black. However, you will usually find red lentils most commonly at the local grocery store, followed by green or brown lentils. Lentils are a powerhouse of nutrients: just a small quarter cup of raw red lentils provides 10 grams of protein, and a quarter cup of green lentils provides 12 grams of protein! In my opinion red lentils are the easiest to cook, and one that I recommend starting out with initially. First, sort through the quantity of lentils to be used to remove small stones or other debris, before rinsing it in cold water (again I usually use my colander and mixing bowl combo) and draining the liquid. Then simply cook 1 cup dried red lentils to 3-4 cups of water, bringing the water to a gentle boil and then simmering on the stove for about 15-20 minutes (or until tender). Remove the lentils and drain out the excess cooked water before using the lentils in the dish of choice. I like to season cooked red lentils with garlic powder, cumin and possibly a dash of onion powder. Brown and green lentils are firmer and hold their shape better with cooking. For faster cooking, soak the green/brown lentils overnight. Using canned lentils is also an option – just rinse and drain well first to remove as much of the salt content as possible. Split peas come in green and yellow varieties. Dried split peas usually need a lot of soaking in order to be able to reduce cooking times. I find it helps to soak a batch overnight, even if I plan to put it in the slow cooker or on the stove the next day. Ready for the next and final step? Read Step 5: Try New Plant-Based Foods & Recipes! Food and Drug Administration. Bad Bug Book, Foodborne Pathogenic Microorganisms and Natural Toxins. Second Edition. [Foodborne Pathogenic Microorganisms and Natural Toxins, pp. 254]. 2012. https://www.fda.gov/downloads/Food/FoodborneIllnessContaminants/UCM297627.pdf. Accessed February 5, 2018. ← You Say ‘Yam’, I Say ‘Sweet Potato’…Which Is It?